The Lace Click tips were created to be shorter in length (3.5), to allow for both 16 and 20 applications. While the 24, 32, and 40 cords from both the regular and lace sets are fully compatible with any style of tip, the new 16 and 20 cords are not compatible with the regular Turbo tips. 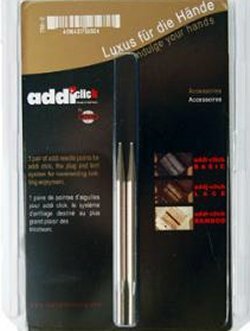 The addi Lace Click tips are nickel plated. Addi's nickel plating process is electro-static, which produces a smooth, rounded edge, where the tip and the cord click together. Knitter's Pride Cubics Special Interchangeable Needle Tips (for 16" cables) Needles and Knitter's Pride Karbonz Special Interchangeable Needle Tips Needles are both similar needles: 3" / 3.5", interchangeable tips, and US 9 (5.5mm) US size.